Feb. 14, 1997, 1-4 P.M.
Alex Grey is one of most important visionary healing artists and performance artists alive today. He portrays spirit, mind, and body to illuminate us. A performance art piece of his is a rare privilege. Mending the heart net is a very special occasion. This piece is the first major piece of performance art done in a hospital to heal. This piece will heal the wounded healer in all of us. Its goal is to heal the community, art and healing, and to heal each of us. Welcome to the place in your heart that can see. This was the announcement posted in the community for Mending the heart net, a performance piece at Shands Hospital, University of Florida, Gainesville sponsored by Arts In Medicine (AIM) as part of the annual conference on art and healing. Mending the Heart Net was a performance piece done at Shands Hospital as a sacred ritual. It is the first performance piece of healing art done in a medical center by a major performance artist. Its goal was to heal the patients, staff, hospital, and earth. It was enchanted. Its occurrence changed the hospital�s sterile space into a sacred celebratory space where love and healing could be manifest with intent. Its beauty and symbolism were transformative to everyone in the community who came and participated. The piece consisted of a heart made of fabric with the continents sewn on it. It had an eye with a fire on the heart and a paint brush surrounded with a serpent on the top of the heart. Around the heart were arms and hands with a heart on each palm. The hands had fingernails. Surrounding the heart was a rope net that went for about twenty feet in each direction. The piece was made by Alex and Allison before they came to Gainesville and was assembled on the site in the hospital atrium in front of patients, family and staff as they walked by or sat and watched. The piece was done in the main entry way of Shands Hospital the main teaching hospital of University of Florida Medical Center. Most of the patients and staff go through this space many times a day. There was a table set up in front of the piece that had bandages and pens on it and an invitation to write out a prayer for someone who was ill or a heart�s desire. 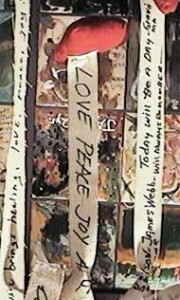 As patients, staff, visitors, family came in and wrote their prayers on the cut bandages, they bandages were pinned to a heart and tied to the web. By the end of the day the web was full of prayers. The prayers said everything from please heal my mother of cancer we love her to may peace come on earth. They were heartfelt and wonderful. The moment of writing the prayer was surprising and magical for everyone. Ordinary people coming in to face difficult times or death could stop for a moment and be with others and pray with intent. In the background was music played by artists on a piano, a harp and guitars. All afternoon people wrote their prayers and talked to Alex, Allison, and Zena. Children in wheelchairs were brought down from their rooms by their parents to see the heart. At the end of the day, Alex , Allison, and Zena, sat inn front of the heart and Alex read a poem. 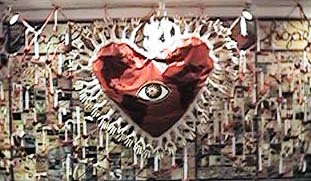 The performance was the making of the heart web and the writing and hanging of the prayers. It gave patients, staff, and families the opportunity to pray with intent and see their prayers in a net with others. The prayers were very moving and transformative. Arts in Medicine artists took the piece down after two weeks and read the prayers out loud and buried them in the earth in a ritual a week later. I believe that this piece was a ritual to make art and healing one on earth, and a ritual to heal the patients, staff, hospital, and to heal medicine and art. It was a prototype of what can be done in any medical center by anyone. Of course Alex, Allison, and Zena, are extraordinary but we all can do this too. Giving people who visit a hospital the opportunity to put out a prayer is very beautiful and transformative. Giving the artists in the program the opportunity to come together in ritual was also valuable. Mending the Heart Net was very beautiful and deeply transformative to all of us. Michael Samuels, M.D., director, Art As A Healing Force.